Rarely do new product launches signal a shift in the market, but I think there's more to this next device than meets the eye. I just got an email from Arta Tech, an ereader seller in Poland. They're announcing the release of their newest model, the Inkbook Onyx, a 6" ereader that runs Android on a dual-core CPU. The Inkbook Onyx sports a 6" Carta E-ink screen (1024 x 758 resolution) with frontlight and capacitive touchscreen. It runs Android 4.2 Jelly Bean on a dual-core 1GHz CPU with 512MB RAM. It has 8GB internal storage, a microSD card slot, and Wifi, but there's no mention in the listing of audio support or Bluetooth. There's also no mention of Google Play, which means you might have to put in extra effort to load Android apps. But on the plus side, you can install Android apps, and the Inkbook Onyx ships with a very adequate reading app, web browser, and a suite of cloud services from Arta Tech. The Inkbook Onyx retails for about 100 euros plus VAT, and it was available early this month. For more details, check out the Arta Tech website. 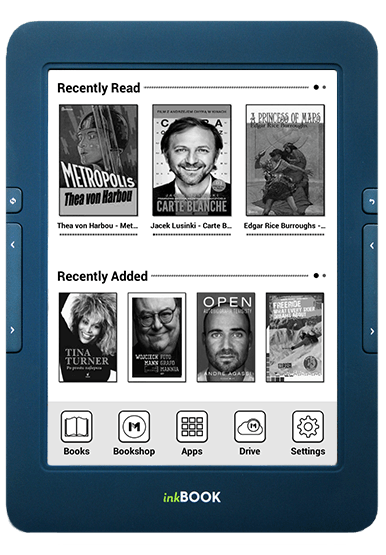 Android ereaders are a dime a dozen these days, but this one caught my eye because this one clearly isn't made by Onyx, Arta Tech's long term hardware partner. No, in spite of the misleading name the Inkbook Onyx is actually made by Boyue. The Inkbook Onyx shares the same design and even the same screen contents as Boyue's other ereaders like the T62+ (aka the Energy Sistem Pro+ eReader), including the button placement (even the case is identical). In fact, the Inkbook looks like a clone of the T61, only with upgraded electronics. It doesn't quite have the same specs (no audio, for example) but the similarities are to great for this too be a coincidence. Update: And I'm not the only one to make the connection. Over at MobileRead this device has been identified as the Boyue T61D. They even found a download link for the Boyue firmware running on it. Clearly Arta Tech has a new hardware partner. This blogger finds that detail newsworthy because I have been growing increasingly frustrated with Onyx repeatedly delaying the launch of their next devices. The i86 8" model, which is due to arrive this week, was delayed for nearly a year and finally shipped with outdated specs (a single-core CPU, rather than dual-core). I can't say whether Arta Tech shares my frustrations but we do see that they have a new partner. At the least that is a sign that the more nimble Boyue is out-competing Onyx, and that is good for consumers. I’ve been thinking about Boyue for a while and I’ve been meaning to ask about the screen color. Is it as pure a white as the PW2? Or do they come with tinges? Yellow, blue, whatever? I thought the PW2 has a brown tinge, actually. The Boyue screens look whiter to me. Whiter is okay, I can always dim it a bit. Although I don’t see much room for whiter than PW2; my mother’s about as white as LCD. My taste runs more towards bone white than titanium white. But either is better than yellow, blue, or green. This would appear to be the slimmest and lightest Boyue 6″ eReader in recent times. It would be interesting to see how it stacks up against the Carta-version of the Onyx C67ML (similar dimensions, but 10% lighter). What do you think, is it better this one or Tolino vision 2, and why? I like page turn buttons and open Android, so I’d get this one. Arta Tech has just released, I initially thought it was made by Onyx since it has Onyx in the name and is being sold by Onyx s authorized retailer, but the device is in fact made by Boyue. + Das Gerät sieht gut aus. Die Farbe ist gut. – Irgendwie schon zu klein, man will bischen größer, aber das alles individuell. – Fingerabdrucke sind eine reine Katastrophe!!! Auf dem Plastik und auf dem Bilddschirm. – Die Knöpfe sind zu hart und laut klicken. Das aber nervt, wenn sie mehrere Stunden lesen. +-Die E-Tinte sieht gut aus, angenehm weiss, genug scharf, aber die schwarze Farbe ist meistens zu hell, besonders beim Sürfen und ich fand nirgendwo, wo das regulieren kann. -Das Soft ist meistens verlangsamt und mir gefällt nicht wie das blickt beim Renovieren oder Umschalten. Irgendwie auch nervt. Meine andere Readers haben das irgendwie weicher gemacht. – Bei eingebauten Leseprogrammen will man deutlich mechr Schriften und Schriftseintellungen. Komischerweise die angebotene Fonts sind auch zu dünn und zu hell ohne großen Regulierungdmöglichkeiten das dunkler zu machen. Man kann irgendwie doch passendes finden, aber muss man lange da tanzen. -Die Leseprogrammen von online Shop funktionieren so eingeschrängt und auch schlecht, so dass ich die kaum benutze. – Vielleicht das Akku hält wie angegeben, aber mit Beleuchtung es lädt sich aus in wenigen Stunden. Mei Nook konnte man eingeschaltet mit Beleuchtung lange liegen lassen ohne dramatischen Folgen. Hier geht so aber nicht. Komischerweise das Licht schaltet sich beim Lesen ab und zu aus, muss man neu einschalten. – Die Beleuchtung von sich alleine is nicht schlecht. Fazit: Nicht so schlechtes Gerät mit nicht so gutem Soft.